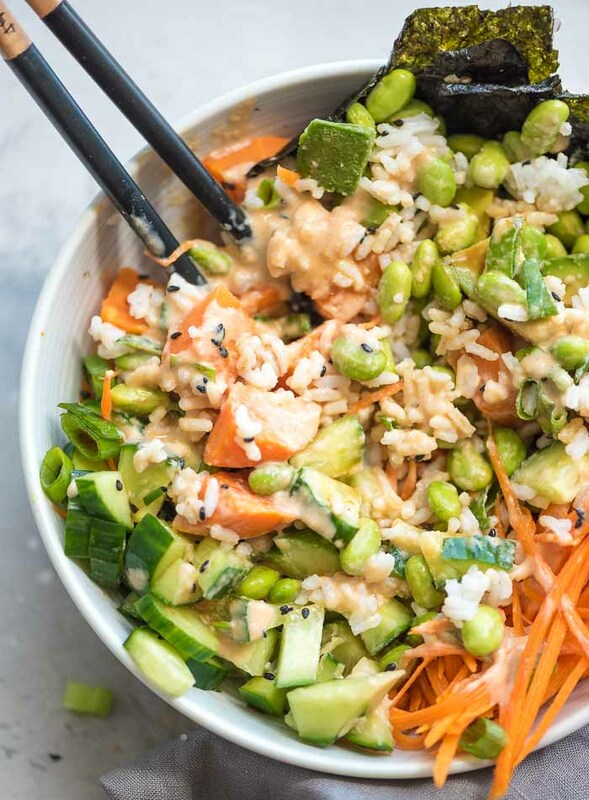 This sushi bowl with vegan spicy mayo is everything you love about sushi, served up in a bowl. 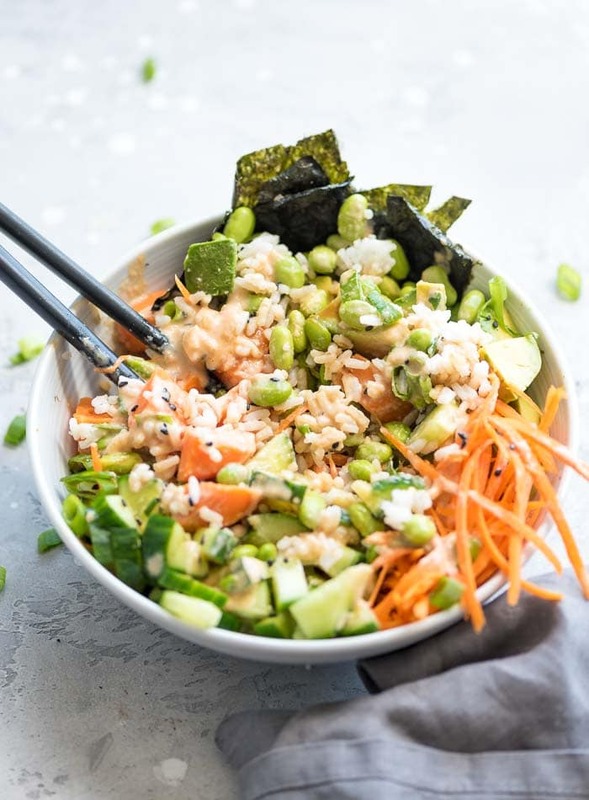 The bowls featured yams, cucumber, carrot, avocado, green onion, sesame seeds, rice, nori and tofu and it’s all topped off with a creamy cashew vegan spicy mayo. I don’t know about you guys but sushi without soy sauce just doesn’t do it for me. I like to add lots of wasabi to my soy sauce and dunk away for a spicy bite. Spicy mayo is also delicious but vegan spicy mayo isn’t something you come across too often in sushi restaurants. In addition to the spicy mayo, I’ve provided a couple other sauce options. You can try a drizzle of easy soy ginger sauce or soy wasabi sauce for another layer of flavour to these bowls, or use them to replace the spicy mayo if you’re not into that. Regardless of where you go with the dressings and sauces though, the real star of these bowls is the rest of the ingredients so even if you just drizzle them with plain, old soy sauce, they’re still going to be good. This spicy mayo is super simple to make and works great over these sushi bowls. All you need to make it is raw cashews, sriracha, pure maple syrup, rice vinegar, sea salt and soy sauce. Just whisk or blend all that up and drizzle over your sushi bowl. I also added some soy sauce mixed with a bit of wasabi powder for that real sushi flavour. As an alternative to the cashew-based spicy mayo, you can also simply mix sriracha with vegan mayonnaise or hummus. I don’t buy vegan mayo since I’m not a big mayo person but if you have it on hand, that makes a quick and easy option. You can also mix sriracha with your favourite hummus and slowly add water until you reach your desired consistency. If using vegan mayo, about 1/3 cup mayonnaise to 2 tbsp sriracha should do the trick, a little spritz of fresh lime juice is good too. If you want to add a second dressing to this smoothie bowl or don’t really like the sound of spicy mayo, you can do a quick soy ginger dressing made from 4 tbsp soy sauce, 2 tbsp rice vinegar, 1 tbsp pure maple syrup and 1/2 tsp each of ground ginger and garlic powder. I didn’t use the soy ginger dressing on mine but did make a quick soy wasabi sauce for a bit of wasabi-bite. To make it all you need is soy sauce and wasabi paste or powder. I use wasabi powder because it lasts forever and is great to have on hand for dressings and sauces. To make soy wasabi sauce, just mix your desired amount of soy sauce with wasabi powder, to taste. Tamari, Soy Sauce or Coconut Aminos? These three ingredients can be used interchangably but what exactly is the difference? Well, soy sauce is soy sauce, of course. It’s made from soy beans, tastes great, is a staple in Asian cuisines, is easy to find and inexpensive. I use light soy suace which just means it has less sodium than regular soy suace. Soy sauce howver, is not gluten-free, but it’s still hwat I use in my kithcen. If you need to cook gluten-free you can use tamari or coconut aminos to replace soy sauce in any recipe. Tamari and soy sauce are both made form fermented soy beans the difference comes down to the presence of wheat. 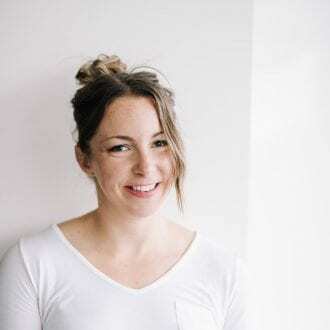 Tamari is considered gluten-free soy sauce however it can contain trace amounts of wheat so make sure you choose one that’s labelled gluten-free if you are coeliac. Soy sauce and tamari taste fairy similar but tamari is usually slightly darker with a richer flavour. I like both so you can experiment and see which one works of you. If you can’t do soy and gluten or just prefer not to, you can use coconut aminos instead of soy sauce or tamari. Coconut aminos is much like soy sauce but made from coconut sap. The sauce is dark, rich and salty with a hint of sweetness and contains various minerals and vitamins. It can be used exactly as you’d use soy sauce or tamari, in stir-fries, for dipping, with sushi, in sauces, marinades and however else you like’d like to use. Alright, let’s get into these sushi bowls! My favourite items to order at a sushi restaurant are edamame, gomae, yam tempura rolls and avocado rolls so I tried to keep these along those lines, with a few extras. 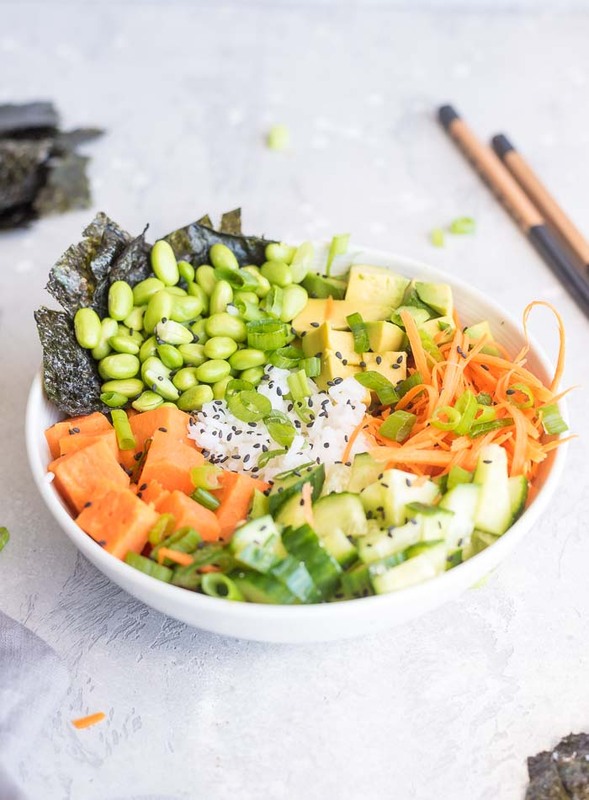 You can customize these bowls to include your favourites but I went with yam, cucumber, carrot, avocado, edamame, rice, sesame seeds and nori. You can use packaged nori snacks or regular nori sheets cut into strips. I used regular nori but the flavoured nori snacks would be really good too, actually I think they’d be a little better since they tend to be a bit crunchier and have more flavour. These Sea Snax would be perfect, just crumble a few over the bowl and dig in. 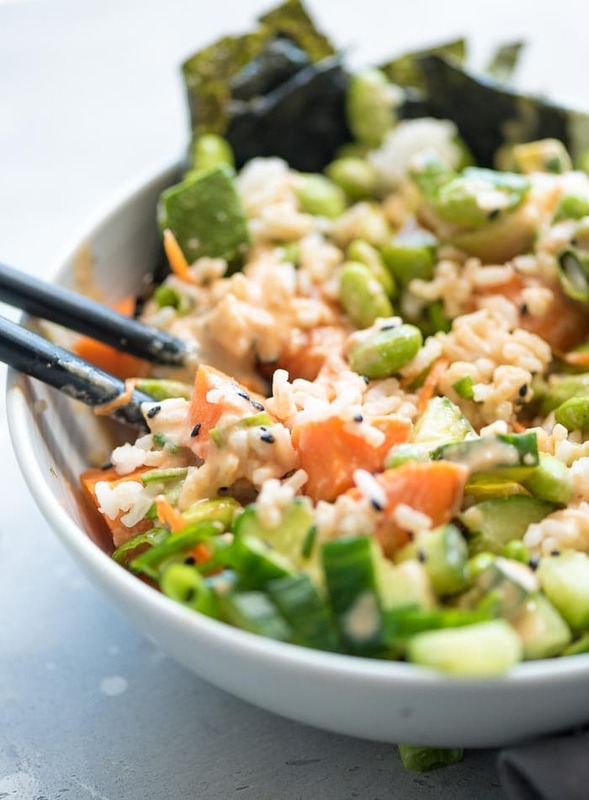 To make the bowls, just cook up your rice of choice, the traditional choice being white rice but brown and wild are also good, then load in your veggies and toppings, drizzle on some sauce and enjoy! 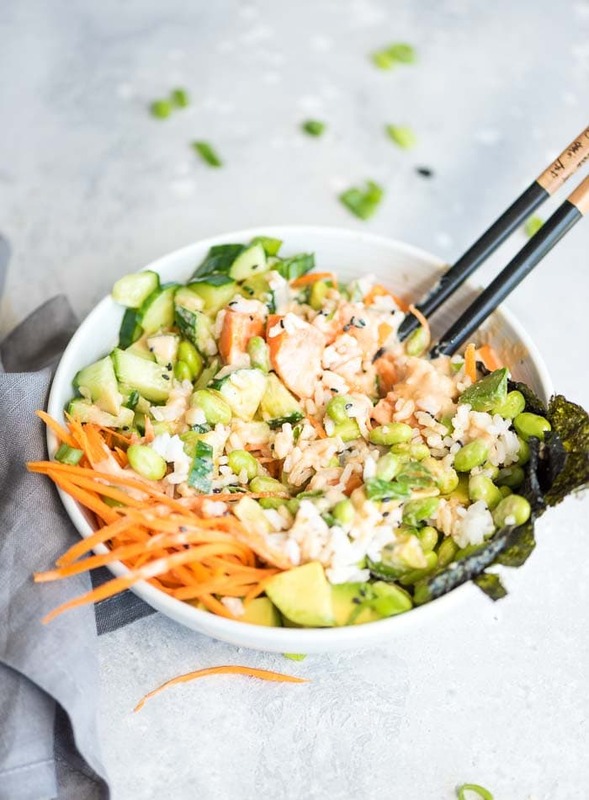 These bowls make a fairly quick and easy dinner, keep well for leftovers and have so many yummy bits and bites they’ll satisfy a sushi craving just like that. These sushi bowls are here to satisfy any sushi craving that might come your way. If you don’t feel like take-out or making your own rolls, through all your favourite sushi ingredients in a bowl and call it a day! To make the spicy vegan mayo, blend all ingredients until smooth and creamy. Assemble the bowls by starting with a scoop of rice and arranging the rest of the ingredients on top. 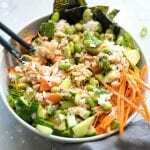 Sprinkle with sesame seeds and green onion, drizzle with spicy mayo and soy sauce and enjoy. The spicy mayo makes enough for 4 bowls, adjust the bowl ingredients accordingly. The sauce is quite spicy so if you don’t like spice, you can reduce the amount of sriracha used or try the soy ginger or soy wasabi option (see post for details). As an alternative to the spicy mayo, you can just add some sriracha to vegan mayonnaise. I don’t usually buy vegan mayo since I’m not a big mayo fan but if you have some on hand, that makes a quick and easy sauce option. Plain soy sauce is just fine too. This looks soo nice! I’ve been having sushi bowls a lot lately but the spicy mayo sounds like an addition I NEED to try! Thank you for sharing!! Hope you like it! Let me know if you try. Made this tonight with both spicy mayo and soy wasabi sauces – it was amazing! Definitely took care of my sushi craving and super easy. I used the nori snacks and they worked perfectly. Will make this one again and again. Awesome! So glad you liked it. I agree nori snacks are perfect on this. Love it with both sauces too! Can I substitute edamame for something that is soy-free? You can just leave it out and add a bit more of one of the other ingredients if you like. Enjoy.